POLITICAL TIDBITS: Despite his obvious hesitation resulting from his family’s earlier trauma with martial law, P-Noy has little choice but to declare state of emergency in certain areas of typhoon-wracked Visayas. His indecision can only aggravate ill-state of preparedness for typhoon, despite its advance billing as Category 5. Despite his obvious hesitation resulting from his family’s earlier trauma with martial law, P-Noy has little choice but to declare state of emergency in certain areas of typhoon-wracked Visayas. His indecision can only aggravate ill-state of preparedness for typhoon, despite its advance billing as Category 5. The aftermath of “worst-ever” typhoon Yolanda appears to be just as gripping as the atmospheric calamity itself, as various provinces of the Visayas struggle to come to terms with the mind-boggling problems it has brought in its wake---a reality check this time. TV footages over the past three days have rendered any attempt to verbally describe the situation there woefully inadequate. For the gargantuan problems include the massive loss of lives and homelessness, power outages everywhere, isolation following closure of airports and downing of cell-sites, gripping mass hunger, economic stand-still, shortness of life-sustaining supplies, illnesses with the closure of a number of hospitals and many others wrought by this history-marking phenomenon. What’s terrible is that Yolanda is now being tailed closely by another typhoon, though hopefully and mercifully much less in intensity, named Zoraida. Extreme hunger has given rise to looting in Tacloban City, Palo City, Tanauan, Tolosa and other towns in Leyte, as well as the destruction of ATM outlets. The feared breakdown in law and order appears to be replicated in other environs of the Visayas, e.g., parts of Iloilo such as the town of Estancia. It clearly stems in many places from the absence of functioning local government, and this in turn could create a huge security challenge to the national leadership that has been caught terribly wanting in preparations, despite public warnings about the impending Category 5 typhoon. The administration has to handle this lawlessness problem decisively for its own good, but interestingly it’s appears to be fearful of imposing a state of emergency in those places---wishing to go only as far as declaration of a state of national calamity. Obviously President Aquino is understandably re-living a family trauma of earlier years about any semblance of martial law, but what is his alternative? His indecisiveness on this issue in the Visayas can only aggravate the administration's woeful ill-state of preparedness to handle the super-calamity---and the specter of anarchy continually rearing its ugly head. This problem of law and order is directly related to another challenge front that has opened up: how to handle the foreign and local aid now pouring in, so that it's evenly and systematically channeled to the people on the ground in utter need of help---and not to the local powers playing politics, as had happened in past calamities. The over-all challenge is how to unite and strengthen our people in the face of the crippling calamity, instead of fragmenting the nation further. It is politics that would cause the fragmentation. The media have played up the “walk-out” by President Aquino during the National Disaster Risk Reduction and Management Council (NDRRMC) conference yesterday in Tacloban City, after he received a long string of “negative reports” on the situation in this epicenter of the typhoon. What seems to have earned his ire was NDRRMC executive-director Eduardo del Rosario’s report that Tacloban City is 95% devastated, and the unconfirmed reports of 10,000 deaths. There's speculation, in fact, that P-Noy’s disposition to tantrums began acting up the moment he landed in the “hostile” territory. Note that the powers that be in Tacloban City are the Romualdezes, led by the recognized leader of a noisy minority bloc in the House, Rep. Martin Romualdez, his brother, Tacloban Mayor Alfred Romualdez and councilor Cristina Romualdez. Rep. Martin has been particularly vocal in his criticisms of the P-Noy administration on various issues---and this has been faithfully echoed by his newspaper, the Manila Standard, and its stable of critical columnists. The “walkout” by P-Noy at the Tacloban conference, however, did not sit well with many citizens. To be sure, by the time he got there yesterday, his head must have already been reeling with all the terrible reports from across the Visayas about Yolanda’s huge swath of destruction. But the problem is that when one's President, he’s not given any allowance to hit the fan, so to speak. rectified without breaking their spirit. “Above all, a leader must lead, Mr. President---not sulk like a cry-baby, or display defeat, or rage in tantrums against lesser mortals like some divine bully. “Lieutenant Colonel Fermin Carangan is the Commanding Officer of TOG 8, the Air Force unit tasked to provide air support for the islands of Samar and Leyte. On the morning of Friday, November 8, he and his troops were in their office near the Tacloban Airport on red alert, having been informed of an incoming super-storm named Haiyan (local name: Yolanda)." We were out of the office at 6 am Friday observing. Winds brought by Yolanda were already strong around that time. We (the Air Force troops in Tacloban) were prepared for the possibility of rescue mission’s days before the expected landfall of Yolanda. Just before 7 am, the rains started to pour, so we took shelter. Around the same time, we noticed that water was slowly entering our office, so we went out again. Then suddenly, we saw that the water was getting higher and higher, until we were forced to get up the ceilings of the building. We had to bore holes on the ceiling just to get up there, and I was the last one up. Suddenly the building collapsed and I saw my men falling into the surging water and very strong winds. There were also no more roofs on top of the building. I was able to hold on to a piece of wood – a truss which I forcibly removed just before I was taken by waves and the strong current. I didn’t notice that my two junior officers were now gone. Both were fresh graduates from the PMA, and they were beside me before we were swallowed by the water. Then I saw one of my soldiers trying to hold on to an uncollapsed wall of another destroyed building. I tried to reach for him but the current was too strong and there was confusion and hysteria. I was going farther and farther out into the sea and all I saw were tips of coconut trees starting to disappear into the swelling water. Suddenly, I saw a child hugging tightly to a floating coconut tree. By a stroke of luck, the current led me to the child, and I was able to pluck him from his very unfortunate situation. He then held on to the piece of wood I was myself holding on to. Then we floated until we were out there in the middle of nowhere. At sea, we went through another hell. We were slapped by waves, great big waves from all directions. We were also toyed by swirling winds. And we couldn’t help but drink a lot of salt water. I was now getting so tired. And so was Miguel (the boy’s name). He was just 7 years old. Too young to die, I thought. I thought of my family. I prayed to God to take care of my wife and kids. I thought I’ve done to them what every father could – that is, to take good care of them. I also thought of my men. Days before, I had told them to ensure the safety of their families, especially those in Tacloban since the city could be hit hard and every one of us would be busy in the rescue missions after Yolanda. They might not have time to check on their families during the rescue. Then I thought of the two new graduates of PMA 2013. I thought that if something happened to me, at least I had been able to give professional and honorable service for a time. And that I’ve done enough since graduation. These two young guys were just starting and still have a very bright future ahead. 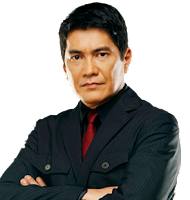 Here is the equally compelling first-person account of Manila Times columnist Erwin Tulfo on coping with Yolanda, titled “There is indeed a God." “Though I go to church every Sunday and believe in God, the Virgin Mary, and the saints, I do not consider myself a religious man or a devout Catholic. “However, my experience last Friday while I was on coverage in Palo, Leyte during the onslaught of Super Typhoon Yolanda made me a firm believer, or shall I say, reinforced my faith that God and the Blessed Mother truly exist. “In my 25 years as a journalist (and I have covered wars and natural disasters here and abroad), never have I seen death staring me in the face. I and my TV news crew, Jerico Javier, my segment producer, cameraman Levi Duriano and his assistant, Teddy Balanza, were on a rented van and were on our way to Tacloban City from Palo when “Yolanda” landed in Leyte that morning. “We were cruising the highway near the beach when a big tree fell in front of our van, forcing our driver to make a u-turn and try to find another route as the wind started to pick up. “But as we sped off to another road, a big acacia tree blocked our path. The strong wind seemed to lift our vehicle in the air. We decided to take cover in an old government building in the area. “However, it was too late to get inside, so we just sat it out on the northern wall of the building facing the Pacific Ocean. Trees in front of us began to tumble one by one like dominoes and the roofs of the houses nearby started flying all over the place. “Minutes later, the wind changed direction and started whipping us in the face so we decided to take shelter on the eastern section of the building. We can now hear the roar of the wind as vehicles were tossed in the air, including a bulldozer. “Suddenly, we can see water coming from the ocean heading inland like a tsunami. In less than minute, we were waist deep in seawater. “As soon as we rushed into the building, the gate that we used to cover ourselves with from the strong winds was literally ripped into pieces. The concrete light post broke in half and fell where we were standing seconds ago as the sea and flood waters merged reaching as high as eight feet. “An hour later, the strong winds stopped and the waters subsided. But the area where we were was reduced to a wasteland. “Though we lost our equipment, including my cellular phones and my clothes inside my backpack, we were all thankful that we were alive. It seemed as if some unseen hands sheltered us from harm. 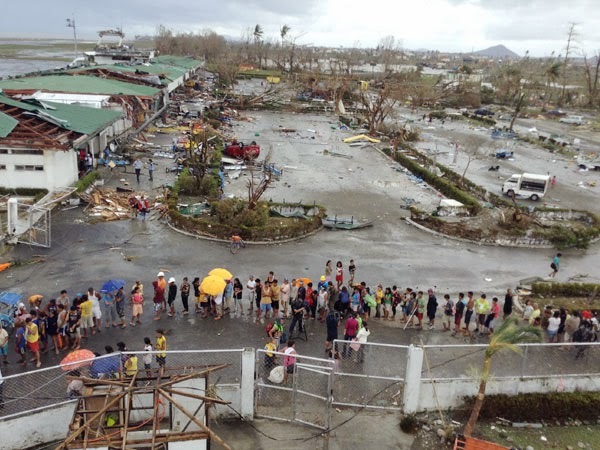 “As we boarded the Air Force plane from Tacloban City going to Cebu last Saturday, I realized one thing. If it is your time to go, you can’t stop it. However, if you ask Him to put it on hold, he may just do that provided that it will be for your good and that of your loved ones and above all, for His greater glory. After all, he owns our lives.